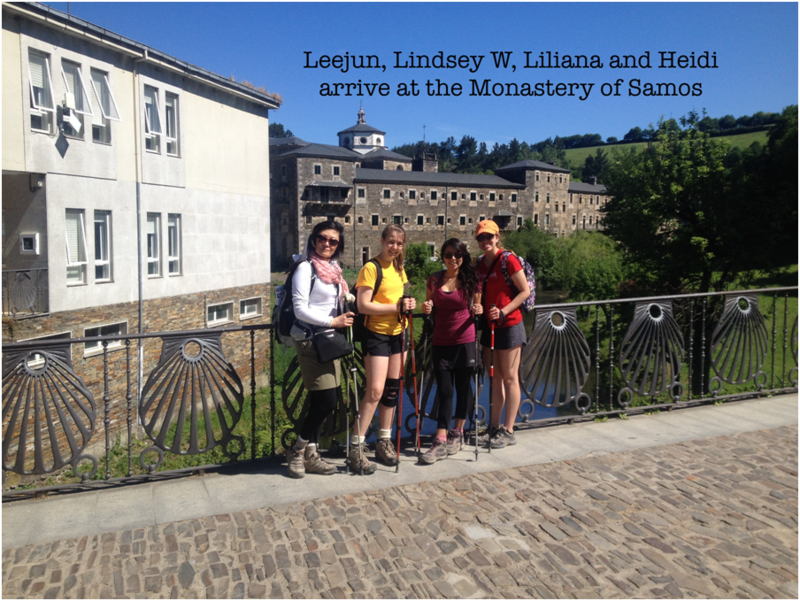 The best parts of the day on the Camino de Santiago are when you lace up your walking shoes early in the morning, and the moment you tear those same shoes from your feet when you arrive at your destination. Excitement and anticipation reign in the morning, pride and accomplishment at the end of the day. 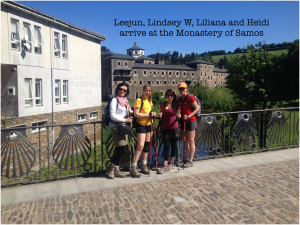 Camaraderie with other pilgrims – we are all in this together, and all of our knees and feet hurt! Quiet reflection and conversation, with your own group and with new-found friends. The occasional holler of “¡¡¡BICIS!! !” as pilgrims on mountain bikes (bicicletas) go careening by, over loose rocks and gravel, usually downhill, usually with their bike helmets strapped securely onto…. the BACKS of their bikes, and NOT their heads! Álvaro S – I have learned that I walk way too fast and I am not able to enjoy the views that way. I have also learned that I love to walk and I am a good traveler. Brianna G – I have learned not to underestimate my abilities. We have walked over 30 miles and are still going! I have learned to slow down and appreciate nature. Leejun T – I like the Spaniards’ relaxed lifestyle and mentality. They are easy going and friendly. Liliana C – Everything is great! Lindsey W – I have learned that life is maybe 10 or even 5% about what happens in your surroundings. The other 90-95% is what you make of it.